Join us on a Quest as we follow the golden thread of wisdom,the half- forgotton spiritual history of the West,in our tenth international conference on the Western Esoteric tradition. 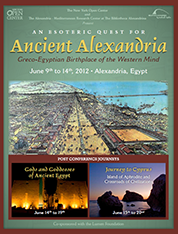 Our most recent Esoteric Quest explored The Mysteries and Philosophy of Antiquity that thrived in Alexandria, Egypt. 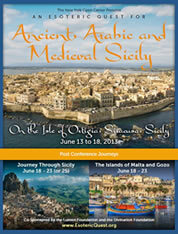 Our conference brought vividly to life the most influential center of culture and esoteric wisdom in antiquity, the authentic birthplace of the Western mind. 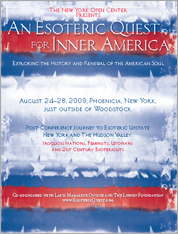 The Open Center’s eighth Esoteric Quest addressed the life-enhancing spiritual impulses that emerged powerfully in America. We brought alive the worldviews of Native Americans, seventeenth century Alchemists, Freemasons and Founding Fathers, Transcendentalists, early Feminists, and Spiritualists. We also honored numerous twentieth century American writers and artists influenced by esotericism, and celebrated the contemporary, multicultural, spiritual explosion. Writers, scholars and performers joined in the beautiful Catskill Mountains at a special moment of rebirth of the American spirit. 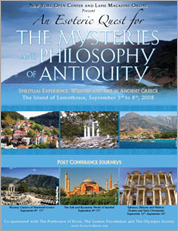 This Quest took place on the magical island of Samothrace, Greece, far off the beaten track in the northern Aegean Sea. For a thousand years, the Sanctuary of the Great Gods on Samothrace was one of the most famous mystery centers of the ancient world, rivaling Delphi in stature and fame. International scholars, writers and artists gathered for the seventh in the Open Center’s series of conferences on the Western Esoteric Tradition. The conference was followed by three optional journeys. One explored the Sufi world of Istanbul, the other journey traveled to Delphi, Eleusis, and other evocative mystery centers of mainland Greece. Lastly we traveled to Ephesus, Didyma, and Miletus, exploring oracles and sacred sites from early Christianity. 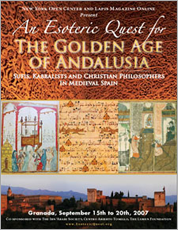 This conference took place in Granada, the evocative and beautiful city lying below the snowy Sierra Nevada that, alone on the Iberian Peninsula, remained under Muslim control until the fateful year of 1492. Outstanding faculty from Spain, France, Britain and the United States addressed such topics as: the Zohar, the Sufis of Andalusia, Arabic alchemy, Ibn ‘Arabi and Rumi, the knowledge system of Ramon Lull, the troubadours, and the place of Spain and Islam in the Grail stories. Evenings were filled with poetry, flamenco, and music that emerged from the blending of ‘Las Tres Culturas‘. This eight-day itinerant conference began in the Czech Republic in Kutna Hora and then proceeded to Marianske Lazne (Marienbad) in western Bohemia. It concluded in Weimar, Germany, and followed the Western Esoteric Tradition from fifteenth century Bohemia to its reemergence in Goethe’s artistic and scientific work. 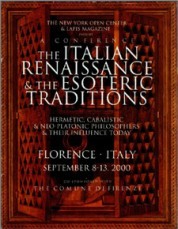 This five-day conference took place in Florence, Italy, and looked at the world of Marsilio Ficino, Pico della Mirandola, and the many other remarkable figures and esoteric impulses that characterized fifteenth century Florence. This conference brought alive the Celtic background of the Grail stories and explored the roots and meaning of the Arthurian legends. 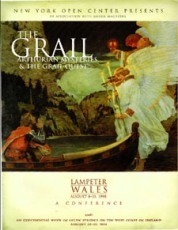 It was held in Lampeter, Wales. 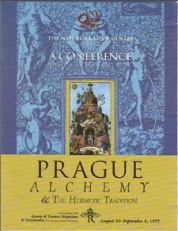 Held at the Zofin Palace on an island in the center of Prague, this conference coincided with the Festival of Rudolf II, King of Bohemia and Hungary, and Holy Roman Emperor in 1600, and investigated many aspects of the alchemical world of renaissance Bohemia. 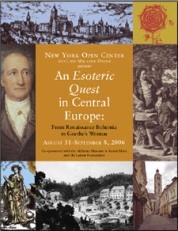 The first of the Open Center’s conferences on the Western Esoteric Tradition, this event brought together scholars, researchers and writers in the Southern Bohemian mecca of alchemists, Cesky Krumlov. 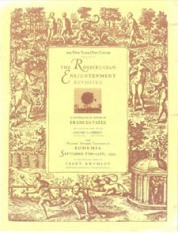 It was named after Frances Yates’ pioneering work, The Rosicrucian Enlightenment.